Mrs. Sethi (Shabana Azmi) is a widow living in Southall who wants to marry off her only daughter, for she is alone and unhappy. Her daughter, Roopi, (Goldy Notay) is a little plump and opinionated. Mrs. Sethi finds that all her matchmaking efforts are rudely rejected. She avenges this behaviour toward her daughter by murdering the failed dates using her culinary skills. A police hunt begins for a serial murderer using a killer curry. Mrs. Sethi does not feel guilty until the spirits of her victims come back to haunt her. They are unable to reincarnate until their murderer dies. 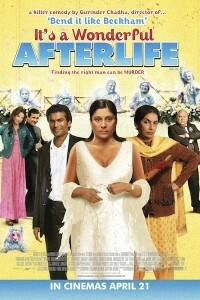 Mrs. Sethi must kill herself to free the spirits, but vows to get her daughter married first. The spirits realise that helping Roopi find a suitable husband before the police catch Mrs. Sethi is in their best interests, and everyone begins to work together. Meanwhile, Roopi catches the eye of the young Sergeant investigating the case. Gurinder conceived the film while watching 'The 100 Greatest Family Films' on Channel 4 when narrator Bob Hoskins introduced a wedding scene from Bend It Like Beckham.